Objects – various funny pictures you can impose anywhere on your video. Emoticons – various funny pictures of smiles you can impose anywhere on your video. Face Masks – 3D Face Masks that wrap around your face through facial recognition technology. Face Accessories – various effects that ManyCam can impose over your face using a built-in face detection function. Borders – fun and cool frames around your photos or video output. Overlays – full-size images to set wallpapers as your video output. Backgrounds – you can place yourself in a background that differs from your real surroundings. When you select a background you would like to place yourself into, ManyCam will prompt you to take a snapshot of your current background without any moving objects in it. You will be given 3 seconds to move out of the camera’s view before the background is applied. Filters – a set of filters to modify your picture. Distortions – various perspective distortions you can apply to your picture. Speech bubbles – a set of speech and thought bubbles to express your thoughts and ideas. Lower thirds – a graphic overlay placed in the title-safe lower area of the screen. Groups category contains all saved presets with chosen effects. You can download new effects from our Effects Catalog or create your own effects using any image you like. 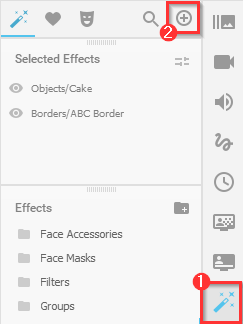 The first and the easiest way to add a new effect to your ManyCam Effects Gallery is to double-click an effect file after you previously downloaded it to your computer from our Effects Catalog (or created your own effect and downloaded it). The new effect will be added to the effect category it belongs to. 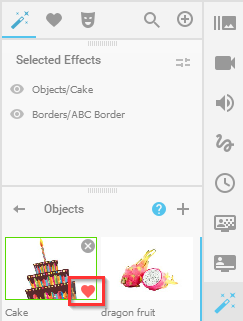 Another way to add newly downloaded effects to your personal ManyCam Effects gallery is by adding them in the ManyCam Effects Tab. 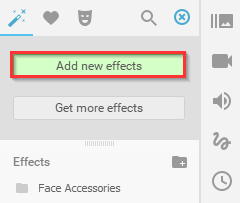 Navigate to the Effects Tab and click on the + icon as shown below. Then locate and select the effects on your hard drive and click Open. When enabled, an effect (including filters, distortions, face masks) is applied to a whole preset. There is no setting to make an effect work in some particular preset layer exclusively. 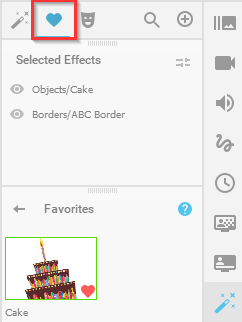 To enable an effect, navigate to ManyCam Effects Tab, select any effect category and click an effect you need. The effect will instantly appear on the ManyCam screen. 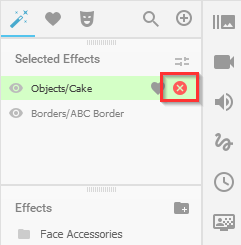 You can disable any effect by clicking it one more time or remove it from the Selected Effects section. All the selected effects will be listed in the upper-right corner. 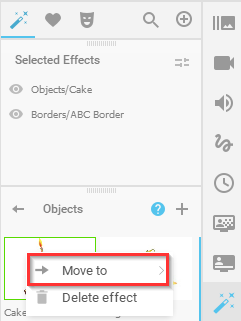 To remove an effect, click on the X icon next to the effect name. You can also hide any active effect by clicking the “eye” icon. You can change the order of the currently selected effects in the Selected Effects section by dragging them up and down the list with your mouse. The Favorites Section contains a list of effects you marked as favorite for easy access. Click the tiny heart icon to add an effect to favorites. Once you marked an effect as favorite, it will immediately appear in the Favorites Section. 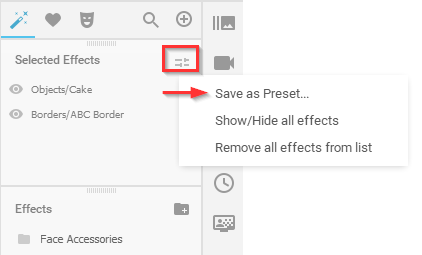 Select effects you like, click on the right top of the Selected window and choose Save as preset. Your preset will be saved into the Groups folder at the bottom of the list. This will allow you to open several effects at once. 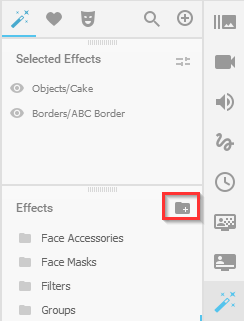 Click the + icon as shown below to create a new effect category. You can move any effect to any effect category. To do so, right-click on the effect and select the category from the Move to drop-down list. Can I create my own animated effects? No, there is no such option at the moment. Can I synchronize effects to my account? 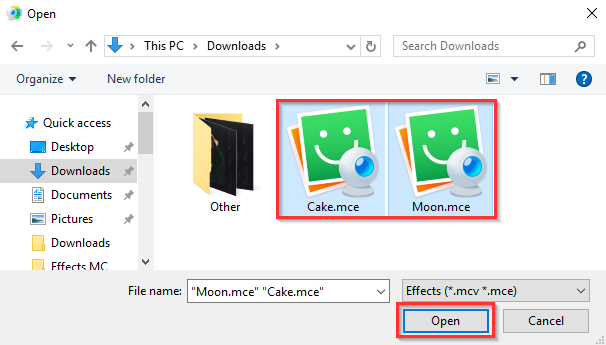 No, in order to open and apply an effect in ManyCam, it must be always stored on your machine locally. Do you offer any free or paid service to create animated effects? No, animated effects can be downloaded from our Effects Catalog only. There are no other options at the moment. Can I apply distortion to a layer? No, distortion effects apply to a whole preset. Some effects are designed for ManyCam for Windows, some are only for Mac. Some effects are simply too old, but they used to be popular several years ago. In the new versions of ManyCam some old effects are no longer supported, however, we don’t remove them from the website since some of our users still use older licenses of ManyCam.